"Females Rule Here In The Northern Forest!" 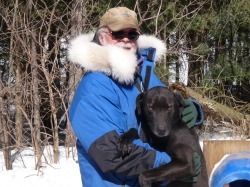 Years ago, I asked a musher what he looked for when picking dogs for his Sprint Team? His answer was, "Black Dogs!". When asked the same question by that musher, My answer was :"Fast Dogs"! In order to be fast dogs they all have to have athletic builds, good bloodlines and desire to excel. Here at Miortuk, there is no preference for color or gender. Here there is a consistency of bloodlines that has produced hard working, durable, enthusiastic speedy athletes. With this being said, We have (now and in the past) more female Leaders! Most of the Leaders her are females with the exception of Max. He had the same attributes that our female Leaders had. He was the same size as many of the female Leaders and great attitude. Here, we have discovered that female Leaders mature quicker, more focussed, a greater desire to please and be upfront. Currently of the 18 dogs in the kennel, 10 are female and 5 of the females are Leaders. I definitely have a young female that has great Leader potential and another that is a possible. However that being said, there are two young males that are also displaying Leader potential. The last litter bred here have 4 of the 6 pups showing potential for lead. That should not be to surprising as we bred Leaders or dogs with Leaders on their close backgrounds in hope of producing Leaders. Female are a little smaller and seem less prone to muscular injuries and strains. We have been very fortunate here being injury free for many years due to a one month conditioning program at the first of the season. Yes, here at Miortuk "Females Rule"! "Simple Life's Pleasures In The Northern Forest!" Life here in the forest is not complicated. It is just living and co-inhabiting with Nature. The week after the holiday weekend, on the first of September, when most Summer Cottagers close up their chalets for the Winter; the Grey Jays returned. It is amazing to me that these very friendly birds are not around during the most populous time in the Summer. They will spend the Fall/Winter/ Early Spring with me here in the Northern Forest. They love to interact with us here and will happily accept food from our hands. They are very gentle when they perch on your hand accepting pieces of bread which they quickly hide in the pine trees and then come back for more. They will talk to you and let you know they are present. I even had one tap on my patio door, letting me know that I hadn't put out its morning treats. It is a simple life here.
" The Fall Migrations Have Begun In The Northern Forest!" This week really marked the start of Fall here at Miortuk. The leaves are turning color, the Hummingbirds have migrated South and the Canada Geese have started their migration. This morning at midnight the first large flock of geese flew over the kennel and more migrating geese were seen through the day. The flocks this year are larger than last year and their journey to their Winter Habitant has started a little earlier. Although, we had a relatively warm week, the nights are getting cooler and by mid week coming the daytime temperatures are going to be in the mid teens. It is also the time to start preparing human food for the upcoming Winter. Most of the preseason chores are done and next week will be nail clipping time for the dogs. Everything will be ready for the start of training for the first of October when this seasons Handlers arrive. It is really a beautiful time of year here!
" The Leaves Are Turning Brown And Starting To Fall In The Northern Forest!" The first photo is just a teaser of the season coming up! Although the weather has started to turn cooler, it is still too early to expect these temperatures to last. This coming week the forecast is for temperatures back into the mid/upper 20's during the day and mid teens through the night. Here at Miortuk, we look at starting our conditioning/training schedule the first of October. The reason for this is the temperatures are getting more consistent with early morning reading being below 10c. Also the first race of the 2019 Schedule is not until the end of January. The schedule here starting in October will have the teams ready for the first race. I also feel it is harder on the dogs to start too early and then have to lay the dogs off for several days and even a week due to warm temperatures. You could imagine giving children candies for a week and then suddenly cutting them off the sweets. They would not be happy!! The same goes for the dogs, getting them all excited to run and then abruptly stopping training due to warm temperatures. Soon the conditions will be right and the new running season will begin here at Miortuk. "Nights Are Getting Cooler Here In The Northern Forest!" The weather here is starting to change with warm days and very cool nights. The Fireweed had started to turn to silk a couple of weeks ago. The theory is when it goes to seed(silk), the first snow is 6 weeks away. That would mean early October. However, things are starting to take shape with preparations for the upcoming season. This week you see the last three members of this seasons team. Yoda is a four year old female. She spent last season learning and getting comfortable at the lead position and is already to run up front this season. Hok'ee is a very versatile dog that can run in any position on the team. He is not a race leader, however can run the position in training. He is more suited to wheel or the team position in front of Wheel. He is very strong, serious runner. He loves to talk to me whenever he sees me. Pearl is a great Point Dog. She has run many races for me and even at Lead in one race. She is steady worker and a great partner for training young dogs at the Point Position. Well, over the last several weeks, you have been introduced to the 18 dogs that will make up the 2018/19 Team.